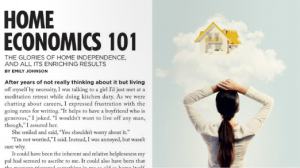 My latest Industry column talks about buying a house and being self-reliant, and all the ways that we actually need help regardless of our claims to independence. After years of not really thinking about it, living off myself by necessity, I was talking to a girl I’d just met at a meditation retreat while doing kitchen duty. As I was talking about my career I listened bored with myself as I expressed frustration with the going rates for writing. “It helps to have a boyfriend who is generous,” I joked. “I wouldn’t want to live off any man, though,” I assured her. “I’m not worried,” I said. Instead, I was annoyed, but wasn’t sure why. Through a turn of fortune I went back to work for myself right after buying my first house. Fortunately I got a good deal, because six months later my position at work was downsized, and I was not only house-poor but also unemployed. Conjuring ways to maintain my dwelling under difficult financial circumstances was a fascinating disjunction – on one hand I clung to my home is an indispensable statement of individualism and identity, but on the other hand I needed help in order to keep it. I had to ask for and receive help from more people I’d ever thought possible, and had accomplished more with their assistance than I ever could have alone. Parents, friends, random acquaintances helped me discover what looking for, buying, financing, and taking care of a house was about. Plus, with the addition of a roommate, I was better off than when I was renting, and the commitment to one place was not a tether as I feared it might be, but instead made me feel grounded and actually freer. Continue reading in Industry Magazine on Issuu.com here . This entry was posted in Relationships and tagged home, home economics, self-reliance on March 9, 2016 by Emily. 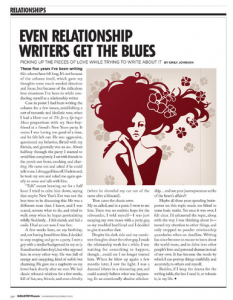 Some times I have a hard time figuring out what’s fair game in my relationships to write about. I don’t really poll everyone to find out if they want to be portrayed in my writing, but whether it’s the age or if they are starstruck by the idea of their own thoughts being published, most people don’t mind. They like to talk about their (love) lives and everyone has opinions. With my personal dealings, in general I tend not to get into the details too much, to protect the feelings of people involved. But though I confess I have often felt a pang about writing authoritatively on relationships when my own ongoing relationships seemed so confusing, I have been able to separate from my own experience enough to know when I’m onto something more generally true. Much of this perspective comes from talking to people, when they’re interested, about the topics I’m seeking to cover, letting it bounce off the hive mind. I don’t like acting the expert, anyway. But I had to separate my writing from my life more decidedly when I went through a particularly bad breakup. I would not be able to write about it for a few years. I share part of my story here in the Nov/Dec issue of Industry. This entry was posted in Relationships on February 23, 2016 by Emily. New column is up over at Issuu.com. I love the title. It sounds like the warm bath feeling of love. In reality, the formalized dance of the dating scene is a joke. And, ironically, as we get older and have less finite time, it takes longer to know someone. More of our time is in the past, adding to our history, and the more just information there is to digest about the other. 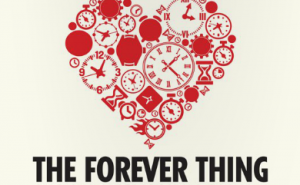 I spent lots of early relationships looking for that climax and denouement, the forever thing. Now, forever unfolds gradually. Still, I liked having a couple of guys on the go at once, for once. It was like applying for lots of jobs, so it didn’t sting as much if I didn’t get one. Maybe that downgraded the individual jobs in my mind a bit. It was successful, though, in that it short-circuited something in me. In the past I would just get so excited about a person, it seemed perversely automatic. Now I was forcing myself to be patient. My former self would’ve seen me as soulless or holding back. Read the rest of Forever here. This is my last column for Industry for awhile, I’m taking a break from relationship writing. Gotta let that ground go fallow. Thanks to everyone at Industry for this opportunity! This entry was posted in Relationships on April 11, 2015 by Emily. To Cheat…or Tweet? 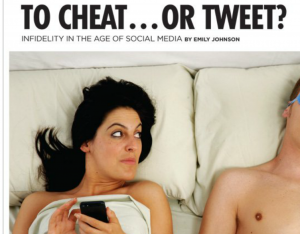 Infidelity in the Age of Social Media, for Industry Feb 2015. I’m arrested by an online confession, a particularly pitiable example of a lonely woman’s sexless marriage. At first glance it’s a tempting glimpse of one road onto the highway of cheating and/or divorce. A lot of the commenters telling her to leave seemed like obvious romantics at first, but they had one major thing in common—they were women who had for the most part experienced the same thing, and they had left and were happier. The other commenters were far more practical in their responses, especially the men; those ranged from the hard truth (he’s gay, or he’s cheating, catch him in the act) to somewhat defensively pointing out that asexuality is a thing. I couldn’t decide on any particular judgment. All I knew (thanks, internet!) was that there were many like her, and that in her article she hadn’t bothered to come up with any of her own solutions, even theoretically. She hadn’t left him nor suggested it. So if she was not gearing up to leave her husband, getting some psyching up from the online chorus, why was this woman even writing? Maybe this confession was a temporary solution in itself, or maybe she wanted another suggestion of escape. My first instinct, therefore, was to give her the out that she seemed to be courting, and comment—that she should get a lover, not least because divorce is so obvious…and high risk. Marriage is often not what we thought, but of course nothing is. I couldn’t help but think of a man (actually men) in a similar situation, just cheating, doing what he needs to do for himself, not railing on a blogging community site about it. So why shouldn’t she? I started to wonder about the passivity beneath her anonymous advice-seeking. Was she just venting, or genuinely seeking help? Maybe she was asking permission to do something she wasn’t yet consciously considering? If so how does her “audience” help and/or hurt the process? Read the rest on Industry’s site. I just hit the send button on my next column. Writing feels belabored, with a million words coming out wrong and me trying to tease a thread that is at times obscure at best. It is especially so when I can’t find the joy. Then it’s just work, confusing work. I guess I could consider myself a professional, in light of the fact that a deadline and editor means I’m doing it, regardless of how it feels. It’s just a bit painstaking, lately, which is uncomfortable. I feel as if I’m continually peeling back layers of received thought and language. I am unlearning. But it seems I’m writing variations on the same theme over and over—about autonomy in our relationship with the world, or the real and the counterfeit. I mean, how long can a relatively clueless person like myself write about relationships, trying to convince others of my idealistic notions? Who am I trying to persuade? Some things I will never know, and some things I can only describe to people who will never see things the way I do. 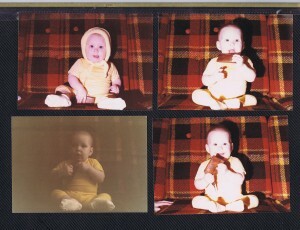 This is me as a baby. I already had the penchant for staring off into space. “What are you thinking about?” my family would ask when I was a little older. “Life!” I said. Well, here’s to finding something to stare at this weekend aside from the TV. This entry was posted in Relationships on March 5, 2015 by Emily. I wrote this for my bro Matt Johnson’s online selling how-to site. We’ve had fascinating conversations about bookselling and general online sales, how the web is changing business, future needs and trends, and how to provide genuinely useful content. This business article is actually a lengthy diatribe against the “mania for the present” thinking that pervades the marketing philosophy engulfing the web. How we use the web, how we’re supposed to use it, how we’re being guided to use it is changing fundamentally. As the whole field becomes more optimized and polished, we are being oriented more toward a passive experience online rather than one we create. Craigslist, for the most part, has remained the same as it ever was. Its ultimate utility was in nimbly catering to whatever people used it for, as its audience expanded out of the tech community, and out of San Fran to other major cities, and then, out of the United States. 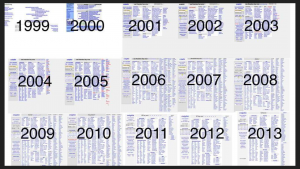 Craigslist’s sticky user experience seems quaint in a world where stagnation equals death. And it’s possible to be too nostalgic, of course. But Craigslist’s continued existence and success questions the “inevitable” speeding up of technological progress, whether it’s necessary, and whom it serves. So what, if anything, can a young entrepreneur in online selling, or business creation, learn from Craigslist? Craigslist is one of the few for-profit online companies I can think of that seems to operate on the basis that, once it has a good user base and income stream, all a company needs to do is maintain an equilibrium and work out problems as they crop up. This is antithetical to the almost religious idea that everything must keep getting better, an ideation that conveniently supports a rat-race ethos, and keeps expensive software engineers busy. Any company or website might be a fad, riding out a trend, and so successful websites start to do things almost immediately to diversify their income and to avoid stagnation. Update early and often, and figure out what you’re doing as you go. But the point is that a lot of tricks used by people to make money online are now eroding confidence and ease of use to such an extent that people are wrestling with them and their impact on all of our lives. Being a profitable company is not itself a winning strategy for a product. Our nativity online was in connecting people, and helping people do what they wanted to do, making things easier, rather than bleeding people dry. Many companies are missing the forest for the trees. Read the rest on How to Be an Online Seller. I can’t wait to write about eBay next! As the Paypal/eBay split attests, much is in play in that company right now. It’s unlikely to be a love letter. This entry was posted in Media and tagged business, craigslist, culture, internet, online selling on February 28, 2015 by Emily. My latest for Industry’s Nov/Dec issue. Road Rules: Or, how to holiday travel together without driving each other crazy. It’s the time of year when opportunities to travel together come up for both new and more seasoned couples. From Thanksgiving through December, Hannukkah, Ramadan, and Christmas come in fast succession. The whole yawning month of frenzied activity ramps up as the year comes to a close. For new couples this can be a trial by fire, as it can involve not just travel (a natural stressor for some) but also possibly meeting family, seeing childhood homes and friends, exes, etc. Here are a few things to think about when making your first trip as a couple. Keep reading on Industry’s website here. I had some real burnout this year writing about relationships, and, let’s be honest, even being involved in relationships. Is it a relief, a comfort, that we feel so perpetually renewed by the feeling of love, that we open our hearts again and again, that we build someone up, that we’re completely fascinated and want everything? I don’t know. I thought it was about time I just grew up and got over my romantic notions and got with reality. Relationships will disappoint you if you let them remain part of some watery province of melodrama. This year’s writing largely reflects my attempts to be more hard-nosed about it, but I can’t pretend I didn’t cross over into cynicism and bitterness occasionally. The more reality you let in, though, the more of a case is made for it, and the less it makes sense to cherry-pick experiences, feelings, people, moods. Suddenly it doesn’t matter what (or who) you do, but how you do it, how you respond. See you in the new year, and thanks for everyone’s support. In 2014, I bought a house, started to feel truly autonomous and savvy, then got really busy, and now I’m back. I’m looking forward to much more content going up here, meaning more yoga, more publishing, and in general, more quirky, serious fun in 2015. 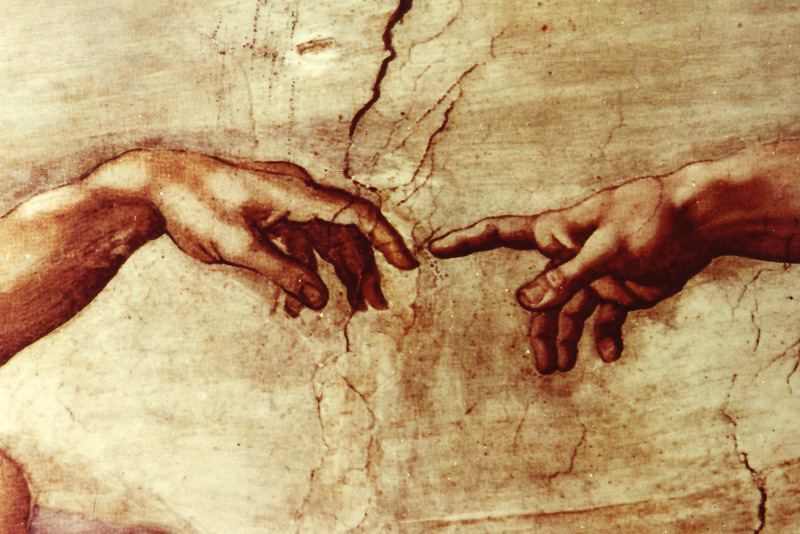 This entry was posted in Psychology, Relationships, Travel, Uncategorized on December 13, 2014 by Emily. 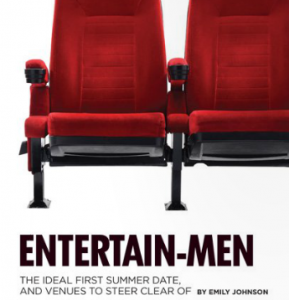 In Industry’s summer issue, I take a walk through the bar scene and ask if the experiences of sexual contest and conquest are really worth the bother (especially for women), or if our jollies are mostly in our mind anyway. The Dark Side | Tales from late-night hookups, near misses, and the end of night wildlife in action. Summer is upon us, and with it endless opportunities to drink in the hot sun and watch our potential attractive mate scenarios get both more fluid and plentiful. With greater potential for getting caught up in potentially embarrassing morning situations, maybe we can pick apart the anatomy of the sexual conquest and see if it’s worth the trouble. Keep reading on Industry’s site here. I know, I know, this is summer piece is right on time for winter. Will re-post next summer, but maybe the clash will make it interesting to read in a different way. This piece came out better than I thought it would, though my editor thought that it wasn’t really a “relationship” article. I had to defend it a bit. Some times you have to take the roundabout way of inquiry when something doesn’t really want to be looked at. Still, I think it’s one of my most accomplished in terms of delicacy of thought. When I satisfy myself, things start to look heaps brighter! This entry was posted in Psychology, Relationships on December 13, 2014 by Emily.